Stainless steel French Presses have turned out to be one of the wisest purchase decisions of coffee snobs. They last the longest, often taste the best and are the easiest to use. The best-seller SterlingPro is the ideal model to begin your search for a stainless steel French Press with. We’ve got a lot of points to back our claim. Scroll down to discover them one by one. We already know that taste is your first reason for choosing a French Press over a Drip Machine. And out of all stainless steel models we tested, SterlingPro proves to have the best taste yet. It is also one of the few models to use two screening processes, namely the Double Screen System. It isn’t as big as it sounds, but includes two filters with two more to spare and does an admirable job at removing sediments from your final cup. This alone helps to increase the flavour of coffee brewed. Though it takes nearly 10 minutes to get there, you’ll simply have no complaints whatsoever. The sales terms ‘Double-Wall Construction’ may seem too fancy to believe. But be rest assured that SterlingPro isn’t misleading you. 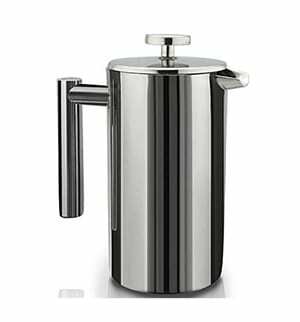 Its carafe is made up of two layers of high-quality18/10 stainless steel. This ensures coffee stay hot for a few hours even in the winter and then warm afterwards. The best part is that the carafe will always feel cool to the touch. You never have to fear burning your hand! Unlike glass carafes, you can use this for many years to come. You don’t have to be extra careful with everything you do, starting from the type of spoon for stirring to the measures taken to wash it clean. Right out of the box, SterlingPro feels well-constructed enough to last forever. The handle is big, and has a solid grip - minimizing the chances of you dropping it. But you need not to worry overly much about dropping it either, for the stainless steel surface is not easy to scratch. It’ll neither break, nor bend - what more could you ever ask for! French Presses are usually a tad more difficult to clean than Drip machines. However, it’s easier to clean a stainless steel model when compared with a glass one. The only gripe might be related to removing the filter and emptying it of grounds. But it’s going to be easy once you get a hang of it. Next, simply put them on the top drawer of your dishwasher or hold it under running water and it’ll be ready to brew again. Make sure you clean it after every brewing cycle. This will help to prolong the life of the screens, which will need to be replaced time to time. The good news is that replacement screens don’t cost much and are readily available. They also tend to make it past an year before a replacement becomes necessary. SterlingPro is unbreakable, light in weight and most importantly - fit enough for outdoor adventures! It has only a 1-litre capacity which makes the overall size much more convenient for a ride in your backpack. If you’re looking for a French Press not only for home-use, but also for outdoor use like camping, hiking, travelling and more, you can always count on this French Press from SterlingPro. There’s not a single person whom we’d not recommend this model for. However we do ask you to be sure of the capacity you choose to buy. 1 litre may seem like a capacity that is enough to pour coffee for your entire family. But take note that it can’t pour more than 4 ounces to 8 cups. With dual filters, robust construction, sleek design and an affordable price, SterlingPro will simply leave you with nothing more to ask for. It is also the best stainless steel model with the highest rating from elated customers. If it satisfies your requirements, then don’t hesitate giving it a go. With dual filters, robust construction, sleek design and an affordable price, SterlingPro will simply leave you with nothing more to ask for. It is also the best stainless steel model on Amazon with the highest rating from elated customers. If it satisfies your requirements, then don’t hesitate giving it a go. I have a SterlingPro French Press and love it. I do have a problem – I can no longer screw the filter back on the press. I have been trying to find the company who makes SterlingPro to email and ask if I can purchase a new plunger. I had see a couple of reviews on Amazon where the reviewer got in touch with the company and were taken care of. If you can point me to the company I would very much appreciate the help.